Considering green kitchen cabinets? You are not alone as they are quickly becoming more and more popular, however the resources available for eco-friendly cabinets are still sparse. Most of us spend many hours in the kitchen but did you know that the air in our kitchen could be making us sick? Choosing a green design in kitchen cabinets basically means you are seeking cabinets that don't place a strain on the environment or pollute indoor air quality. Many are considering green kitchen cabinets over conventional cabinets because green cabinets do not release toxic gases into the air. These gases come from the substrate used in the manufacturing process-particle board. But how could something as innocent as particle board leach harmful gases into your kitchen? The particle board or fiber board used in the majority of kitchen cabinet boxes is created from a urea formaldehyde resin which is a known carcinogen. This substrate out gasses formaldehyde the entire time it is in your kitchen. To make matters worse, any time the formaldehyde comes in contact with a heat source, the emissions are 'cooked' therefore making them more concentrated and more toxic when released into the air. Think of all the appliances in your kitchen near the cabinets heating the formaldehyde- cooktops, wall ovens, dishwashers... the list goes on. If you are interested in formaldehyde free kitchen cabinets there are several choices available to you. * Obviously stainless steel kitchen cabinets or any other metal cabinet is going to be free of toxic chemicals and are a safe bet. * But what if you have your heart set on real wood? There are several green kitchen cabinet options available to you. First and foremost, do your research before settling on a manufacturer of green kitchen cabinets. When choosing a cabinet manufacturer who claims to have 'green cabinets' be sure to ask for certification that their products are indeed formaldehyde free and created with no or low VOC's. * Request that your cabinet boxes be made with wheat board or straw board. Wheat board is basically the remnants of the straw waste left over from farmers' wheat crops. The plant stems of the wheat(straw) are finely milled and bound together with sustainable binders that are formaldehyde free. If you are concerned about the strength and durability of this product, wheat board meets and many times exceeds the set standards for particle board in North America. Not only is wheat board free of breathable toxins it also makes good use recycling an organic waste product that would otherwise be disposed of. * If you already have cabinets made of particle board and want to remove the danger of further outgassing in your kitchen you have a couple of options. Obviously you could replace your existing cabinets with 'green' cabinets. Another more budget friendly option is to remove the face of your cabinets first and purchase a no VOC water based sealant to thoroughly cover the cabinet boxes. If purchasing a sealant, it is highly recommended that you make sure to completely cover every square inch of surface as well as all cracks to prevent further outgassing. In other words don't skimp on sealant because you may be skipping areas that will continue to contribute to outgassing. Below is a link to a sealant you can apply to your kitchen cabinets to prevent or reduce further gassing. Another tip is to make sure the clear sealant applied to exterior cabinet doors,frames and cabinet panels is a no or low VOC (Volatile Organic Compound) water based finish. This is crucial because the majority of clear finishes used to seal the wood on cabinet exteriors emit high levels of VOC's which produce harmful levels of gas in the air. Luckily today more and more manufacturers are producing no or low VOC finishes. These are only available upon request, however the benefit is that they are odor free and are not harmful to your health. Below is a link to a clear and natural finishes that nontoxic. 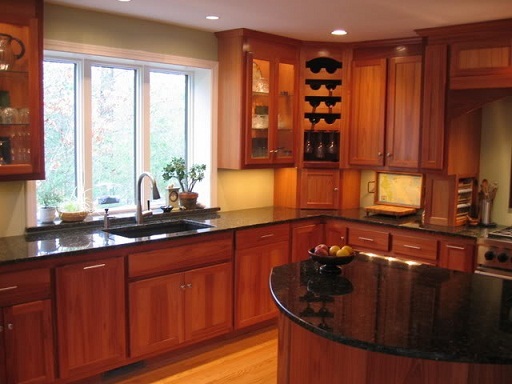 The most common material for green kitchen cabinets is the non lumber product bamboo. Not only is bamboo appealing to the eye and durable, but it is also rapidly renewable. 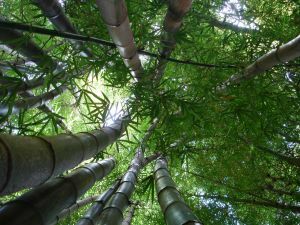 Bamboo can mature in less than half the time it takes hardwood trees to reach market size making it a popular choice for environmentalists. Another popular option is to use recycled wood in order to cut down on deforestation. These can often be obtained from salvage businesses. Often older kitchen cabinets are discarded which are made from solid wood, thereby eliminating the threat of particle board problems. Sanding, staining and refinishing these with a no or low VOC finish can be a wise economic choice for those who aren't able to afford green kitchen cabinets. You may also order from a green kitchen cabinet maker directly. The choices are greater today than ever on different types of wood available. Many offer the alternative of choosing reclaimed wood which gives the owner a feeling of owning something bigger than oneself. You never know the history that may be behind a great structure that was demolished and reclaimed to build your kitchen cabinets! Many of the common wood species used in conventional cabinets are also available in green cabinets. Here is a guide to finding your suppliers and manufacturers of green cabinetry.